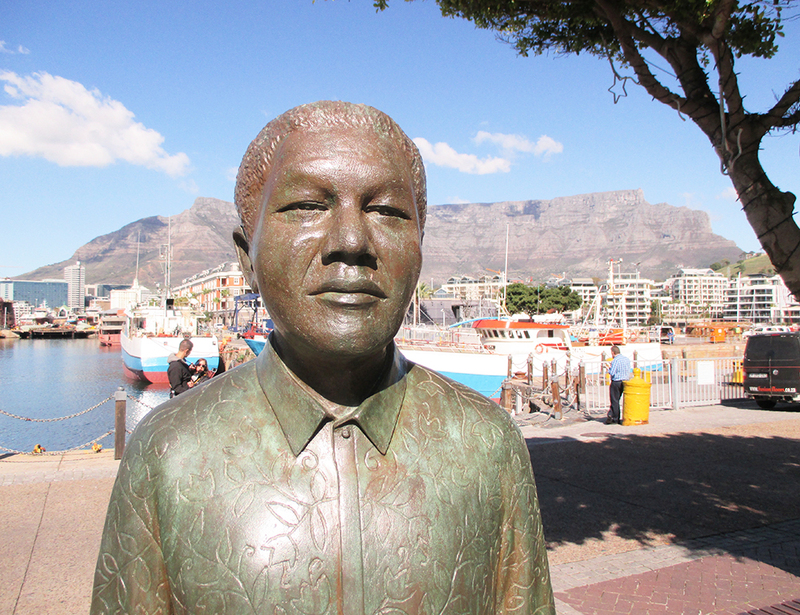 A sculpture of Nelson Mandela stands on the waterfront in Cape Town. I recently returned from a trip abroad with my wife, Mary, and our youngest daughter. We visited South Africa, where we encountered wildlife, learned about apartheid and suffered theft and fraud initially exceeding $3,500. On our third day in Cape Town, Mary and I took a free walking tour that covered the country’s history of state-sponsored white supremacy: harsh laws and restrictions separating citizens by categorized race. We were walking near the Parliament on our way back to our Airbnb when a man approached us wearing the fluorescent green vest common among public safety workers throughout the city. He asked where we were headed and explained that we needed a pass for that area. He said it was for our safety. It was a couple of days before mass protests advocating the ouster of the country’s president. I knew from U.S. State Department notices that such demonstrations often get out of hand. At the same time, a young man came from the other direction and asked the man in the vest for a pass. He directed the young man to what looked like an ATM attached to the building behind us. The young man, who spoke English better than the man in the vest, returned moments later and offered to help us get our pass. He said I just needed to insert a bank card in the machine and follow the prompts. The young man said it was tricky and showed me precisely how to insert the card while also pointing at instructions on the screen, which I couldn’t read because of glare from the sun. Then, the man in the vest came over and said I needed to punch in my PIN code for the card. The pass was free, but the system had to verify my identity. That seemed reasonable, and I was controlling the keypad, so I figured I could cancel the session whenever I wanted. Bankrate.com compiled useful travel tips. Here’s a list. Pack a backup credit card. Watch out for bogus ATMs. Keep a close eye on that debit card. Make copies of important financial information. Tell bank and credit card companies about travel plans. Clean out your rental car. Research foreign destinations before your trip. To the side, Mary urged me to stop. In 28 years of marriage, I have learned that occasionally – to my misfortune – I tune out Mary’s advice. Finally, though, I hit “cancel” to retrieve my card. But the machine appeared to have eaten it. I looked up, and both men were gone. “I think he palmed your card,” Mary said. So, while one man absconded with my card, the other sneaked a read of my PIN. We hurried back to the Airbnb, where I promptly logged in to my credit union account. I alerted the institution to what had happened and noted that we had not used the card so far on our trip. When I checked my email, I already had a notice from the credit union’s fraud prevention services of transactions of $41, $11, $2,634, $75, $151, $226 and $376. I consider myself somewhat streetwise. I have traveled before. In my 20s, I made my way through Asia on my own. I read about and have written articles on protecting yourself from fraud. I also know that I tend to give most people the benefit of the doubt – even strangers in strange places. I had let my guard down, and it took only a moment to be taken in by this scam, which has been so successful that within the next 24 hours, we were approached by three other people in various parts of the city telling us that we needed passes for where we were going. I was stupid. I should have known better. And yet, I rationalize that we can’t anticipate the sophistication of every crook trying to separate us from our money. Meeting people is much of the joy of traveling for me. I would rather not mar that by cynically regarding everyone I encounter as a scoundrel and thief. As it turns out, I had planned for possibilities such as this. Between Mary and me, we had separate and various means for covering expenses along the way. We had alerted the credit union and our credit card issuers of our travel plans. And, I had set up an individualized code key from the credit union, adding an extra layer of verification to get access to my account from 8,700 miles away. Crime accompanies poverty in South Africa. After generations of suppressing opportunities for the majority of its population, South Africa is struggling to realize its potential. The country’s official unemployment rate is 27.7%. Economic output has receded the last two quarters. The World Bank estimates that 17% of the population lives below the global poverty line of $1.90 a day. Yet, all the surrounding countries are even more impoverished, which fuels immigration, adding to the number of people starving for opportunity in cities like Cape Town. Immediately following the theft of my debit card, I felt less charitable and even resentful toward beggars who approached us in Cape Town. But I would rather show kindness to them than lose money to organized cheats. So, with the belief that we had limited the losses from the card theft, we adopted a routine of not eating all the food we were served and sharing restaurant leftovers with those who asked. The day after we got home, a fraud investigator from the credit union called me to ask what had happened. She said she had heard of such a scam before but that I was able to help her understand how it worked. Two days later, the credit union reimbursed my account for the fraudulent transactions, which ended up totaling $519 because some of the attempts failed. I was fortunate. Debit cards don’t carry the same liability protections against fraud as credit cards, which generally limit such losses to $50. I would like to think that prompt, thorough disclosure helped. In any event, we now can tally this misadventure as a lesson to share with others and a reminder to ourselves that thinking ahead and keeping our head can put us in a position to take care of our money and still make the most of our travels away from home.